China’s nuclear arsenal has long been an enigma. The arsenal has historically been small, based almost exclusively on land-based ballistic missiles, maintained at a low level of alert, and married to a no-first-use doctrine – all choices that would seem to invite attack in a crisis. Chinese leaders, when they have spoken about nuclear weapons, have articulated ideas that sound odd to the Western ear. 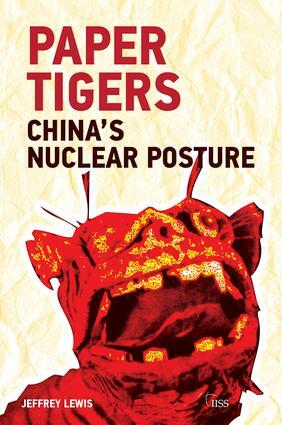 Mao Zedong’s oft-quoted remark that ‘nuclear weapons are a paper tiger’ seems to be bluster or madness. China’s nuclear forces are now too important to remain a mystery. Yet Westerners continue to disagree about basic factual information concerning one of the world’s most important nuclear-weapons states. This Adelphi book documents and explains the evolution of China’s nuclear forces in terms of historical, bureaucratic and ideological factors. There is a strategic logic at work, but that logic is mediated through politics, bureaucracy and ideology. The simplest explanation is that Chinese leaders, taken as a whole, have tended to place relatively little emphasis on the sort of technical details that dominated US discussions regarding deterrence. Such profound differences in thinking about nuclear weapons could lead to catastrophic misunderstanding in the event of a military crisis between Beijing and Washington. Dr. Jeffrey G. Lewis directs the East Asia Nonproliferation Program at the Center for Nonproliferation Studies, Monterey Institute of International Studies. Dr. Lewis is the founding publisher of Arms Control Wonk.com, and an affiliate with the Stanford University Center for International Security and Cooperation.